Amazon Kindle books can be read on Kindle eReaders, Kindle Fire tablets as well as other smart devices with Kindle apps installed. But if you’ve got non-Amazon eBooks or eBooks in a non-Kindle-supported format on your computer, it won’t work by simply transferring them to Kindle devices for reading. In this article, we are going to show you how to make sure the eBooks you transfer from your computer to Kindle via USB cable can be read normally. Nowadays, most eBooks are protected in DRM. If you want to put eBooks purchased from Adobe, Kobo, Nook or any other stores, instead of Amazon, to Kindle, you’ll have to remove the DRM before transferring them to the device. In addition, Kindle doesn’t support EPUB format. If you directly transfer your .epub books to Kindle, it won’t recognize them let alone open them. Therefore, it’s a must to convert them to a Kindle-supported format, like MOBI, before executing the transferring. In a word, to efficiently transfer eBooks from computer to Kindle for reading, make sure the eBooks are in a Kindle-supported DRM-free format. But what if the eBooks you want to read on Kindle are in a non-Kindle-supported DRM-protected format? Can you transfer and read them on Kindle? Absolutely yes! Below is a step-by-step tutorial for your reference. Note: If the eBooks you want to transfer to Kindle are in a Kindle-supported DRM-free format, please skip Step 1 - Step 4 and directly go to Step 5. 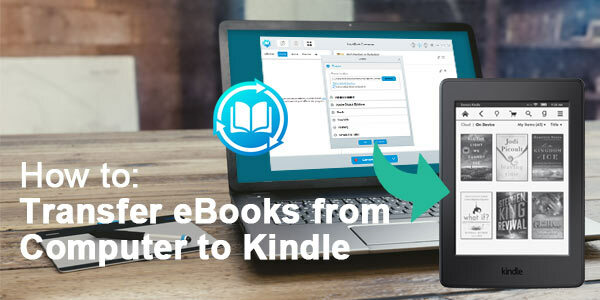 Any eBook Converter is a professional eBook tool that can remove DRM from Kindle, Adobe, Kobo & Nook eBooks (up to 24 input formats) and convert them to DRM-free EPUB, PDF, MOBI, AZW3, TXT or KFX format in batch. Click "Add eBook" button on the upper left. There will be a pop-up window allowing you to browse and upload the eBooks that you'd like to transfer to your Kindle for reading. 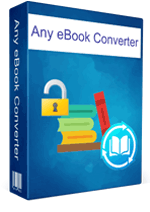 The DRM of the eBooks will be removed immediately once they are successfully added to Any eBook Converter. Click “V” icon on the bottom and you'll then be able to select the output format. Here we suggest you choosing “MOBI” as the output format. 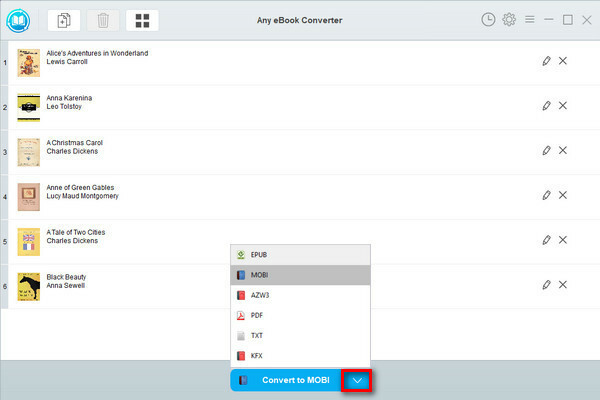 Click "Convert to MOBI" button to start converting your eBooks to MOBI format. 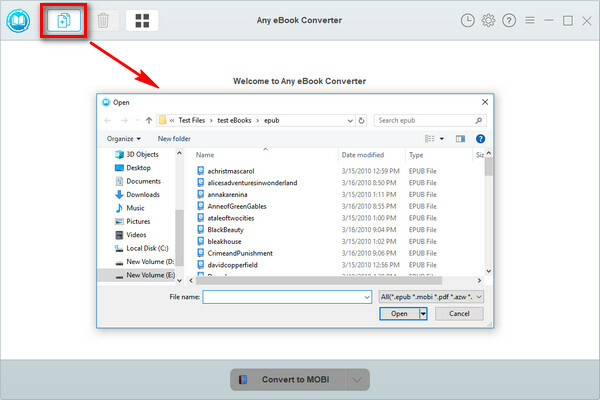 When the conversion is done, you can find your eBooks in Kindle-supported MOBI format by clicking the “History” button on the upper right or directly going to the output folder you set in previous step. Connect your Kindle to computer using a USB cable and your Kindle will be recognized as a removable drive. Double click the drive to open it and view the folders. 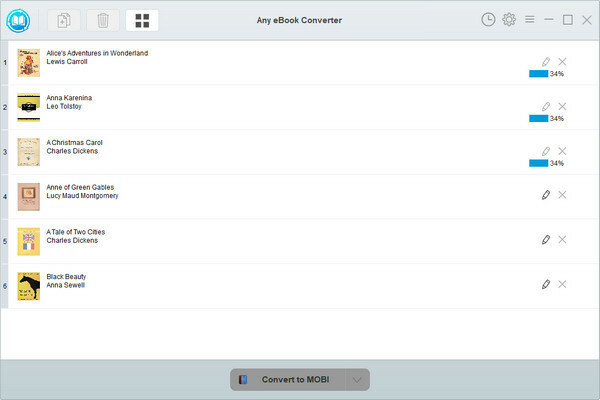 Select the eBooks you want to transfer and then copy them to the Document folder under the Kindle drive. Finally eject your Kindle from your computer and then you’ll be able to read the eBooks on your Kindle. Please make sure you place the eBooks in the Documents folder on your Kindle device. If you put them in the root drive, they won’t appear on the Home screen of your Kindle.